TMPRSS2-ERG gene fusions occur in about 50% of all prostate cancer cases and represent promising markers for molecular subtyping. Although TMPRSS2-ERG fusion seems to be a critical event in prostate cancer, the precise functional role in cancer development and progression is still unclear. We studied large-scale gene expression profiles in 47 prostate tumor tissue samples and in 48 normal prostate tissue samples taken from the non-suspect area of clinical low-risk tumors using Affymetrix GeneChip Exon 1.0 ST microarrays. Comparison of gene expression levels among TMPRSS2-ERG fusion-positive and negative tumors as well as benign samples demonstrated a distinct transcriptional program induced by the gene fusion event. Well-known biomarkers for prostate cancer detection like CRISP3 were found to be associated with the gene fusion status. WNT and TGF-β/BMP signaling pathways were significantly associated with genes upregulated in TMPRSS2-ERG fusion-positive tumors. The TMPRSS2-ERG gene fusion results in the modulation of transcriptional patterns and cellular pathways with potential consequences for prostate cancer progression. Well-known biomarkers for prostate cancer detection were found to be associated with the gene fusion. Our results suggest that the fusion status should be considered in retrospective and future studies to assess biomarkers for prostate cancer detection, progression and targeted therapy. Prostate cancer is the most frequently diagnosed malignancy and still one of the leading causes of cancer related death in men . Since the discovery of a recurrent gene fusion between the androgen responsive gene TMPRSS2 (transmembrane protease, serine 2) and ERG (v-ets erythroblastosis virus E26 homolog (avian)) on chromosome 21 , prostate cancers are molecularly divided into "fusion-positive" and "fusion-negative" cancers. Although the TMPRSS2-ERG fusion is a critical early and common event in prostate cancer development and progression [3, 4], the clinical implications of the fusion are controversial [5–9] and the functional consequences are unclear. After the rearrangement, ERG expression is driven by the androgen-responsive promoter of TMPRSS2, resulting in a significant upregulation of the transcription factor ERG [2, 10]. Initial in vitro experiments demonstrated that ERG overexpression leads to increased invasion via the induction of metalloproteinase and plasminogen activator pathway genes . The molecular effects of the gene fusion were recently found to be associated with an activation of WNT-signaling which induces epithelial-to-mesenchymal transition (EMT) and loss of cell adhesion [12, 13]. Additionally, ERG overexpression was shown to modulate androgen receptor signaling and to initiate epigenetic silencing resulting in cellular dedifferentiation . To study the functional consequences of TMPRSS2-ERG fusion on the transcriptome level, we analyzed large-scale gene expression profiles using Affymetrix GeneChip Exon 1.0 ST microarrays. Our results demonstrate that the TMPRSS2-ERG gene fusion leads to transcriptional modulation, which is associated with widely accepted prostate cancer biomarkers and signaling pathways. Prostate tissue samples were obtained from the University Medical Center Hamburg Eppendorf. Approval for the study was obtained from the local ethics committee and all patients agreed to additional tissue sampling for scientific purposes. Tissue samples from 47 prostate cancer patients with clinical high-risk tumors were included (Additional file 1: Table S1). None of the patients had been treated with neo-adjuvant radio-, cytotoxic- or endocrine therapy. During radical prostatectomy, tissue samples from the peripheral zone of the prostate were taken with a 6 mm punch biopsy instrument immediately after surgical removal of the prostate from tumorous areas as described before . The punches were immersed in RNAlater (Qiagen, Hilden, Germany) for 24 h at room temperature and subsequently stored at -80°C. To confirm the presence of tumor, all punches were sectioned, and the tumor cell content was determined in every 10th section. Only sections containing at least 70% tumor cells were included in the study. Normal prostate tissue samples from non-suspect areas of the peripheral zone were obtained similarly from 48 different patients with clinical low-risk tumors who underwent radical prostatectomy. These punches were also sectioned and inspected for the presence of normal prostatic epithelial cells in every 10th section. Only sections containing between 20% and 40% normal prostatic epithelial cells were included in the study. Total RNA was extracted using the AllPrep DNA/RNA Mini kit (Qiagen) according to the manufacturer's instructions. Briefly, tissue sections were homogenized in 1 ml RLT Plus buffer using TissueLyser (Qiagen). After DNA separation, 1.5 vol. of 100% ethanol were added to the total RNA and the mixture was purified. The quantity and quality of the total RNA was checked using the Nanodrop photometer (Peqlab, Erlangen, Germany) and the Bioanalyzer (Agilent, Böblingen, Germany). Samples with low RNA quality (RIN < 6) were excluded from further analysis. The Affymetrix (Santa Clara, USA) GeneChip Whole Transcript Sense Target Labeling Assay was used to generate amplified and labeled sense DNA. Briefly, 1 μg of total RNA was used for rRNA reduction. Following the manufacturer's instructions, cDNA was hybridized to the Affymetrix 1.0 Human Exon ST arrays and incubated at 45°C for 16 h. The washing and staining steps were carried out using the GeneChip Fluidics station FS 450. Slides were scanned with the Affymetrix Gene Chip scanner 3,000 7 G system. TMPRSS2-ERG fusion events were verified using RT-PCR. cRNA from the Affymetrix Whole Transcript Sense Target Labeling Assay was reversely transcribed. 10 ng of cDNA were used for RT-PCR based validation. Initial amplification as well as nested PCR was done using primers described by Jhavar et al. . All products were separated by agarose gel electrophoresis. Additionally, the TMPRSS2-ERG fusion transcript was quantified in clinical prostate samples by Taqman (Life Technologies, Carlsbad, USA) real-time PCR using the equivalent of 10 ng as a template. Quantification was performed with 2 × ABSOLUTE QPCR Mix (Thermo Scientific) on the LightCycler 480 System (Roche) using the assay described by Mertz et al. . The amounts of ERG (Hs01554635_m1), CRISP3 (Hs00195988_m1) and TDRD1 (Hs00229805_m1) transcripts were determined relative to B2M (Hs99999907_m1) using the second derivative maximum method of the LightCycler software (validation results are summarized in Additional file 2: Table S2). Gene expression data from the Affymetrix cel files were analyzed using the statistical computing environment R http://www.cran.r-project.org. Gene expression profiles were obtained by applying the Robust Multichip Average (RMA)  implementation included in the Affymetrix Power Tools (APT). The MIAME-compliant microarray data were submitted to the NCBI GEO database (GSE29079). Differentially expressed genes were determined using a moderated t-statistic . All p values were corrected for multiple testing, and genes showing a false discovery rate (FDR ) ≤ 0.05 were considered as significantly deregulated. TranscriptCluster IDs of deregulated genes were subjected to pathway exploration using the Ingenuity Pathway Analysis software (Ingenuity, Redwood City, CA). To assess the significant differences of single gene levels, a two-sided Wilcoxon test was used. A p value < 0.05 was considered as significant. For validation purposes, 131 prostate cancer samples from publicly available gene expression data (Taylor et al. ) were re-analyzed using the methods described above. Fusion-positive and negative samples were assigned according to their ERG expression levels. Samples with a considerable high ERG expression (48 samples; > 9.2) were labeled as fusion-positive, whereas tumor samples with low ERG expression (72 samples; < 8.0) were marked as fusion-negative. 11 samples with median ERG expression (8.0 < ERG < 9.2) were omitted from the analyses. Gene expression profiles were successfully obtained from 47 cancer and 48 normal prostate tissues taken from non-suspect areas of the peripheral zone from clinical low-risk tumors. A limitation for the comparison between tumor and normal was the variability of stromal components and clinical characteristics (Gleason scores/stages) between tumor and normal tissues (see methods). In a first explorative analysis, we compared the gene expression levels in tumor and normal prostate tissues. Considerable transcriptional deregulation was identified in the malignant tissues: 263 genes had at least a twofold change in expression levels (Additional file 3: Table S3). The list of deregulated genes contained markers that had been described in prostate cancer before (e. g. CRISP3, AMACR and MYC). Additionally, several genes with unknown function like TDRD1 and C20orf74 were identified as biomarker candidates for prostate cancer. To compare the gene expression levels between TMPRSS2-ERG fusion-positive and negative tumors, we included only samples (n = 37) with reliable assessment based on ERG exons/gene expression levels, nested RT-PCR as well as quantitative RT-PCR measurements (Additional file 2: Table S2). We excluded a group of samples with median ERG expression levels, since our initial explorative analysis demonstrated that these samples might lead to noise in subsequent statistical analyses. Seventeen tumor samples were defined as TMPRSS2-ERG fusion-positive and 20 samples were defined as TMPRSS2-ERG fusion-negative. A total of 1,635 genes was differentially expressed between TMPRSS2-ERG positive and negative tumors (FDR < 0.05). The exclusion of the cases with a median ERG expression level might explain the relatively large number of significantly deregulated genes in comparison to other published studies. Roughly 75% of the differentially expressed genes were upregulated in patients with TMPRSS2-ERG gene fusion, which is in line with other reports [13, 21, 22]. A subset of 126 genes showed at least 2-fold expression changes (Additional file 4: Table S4). 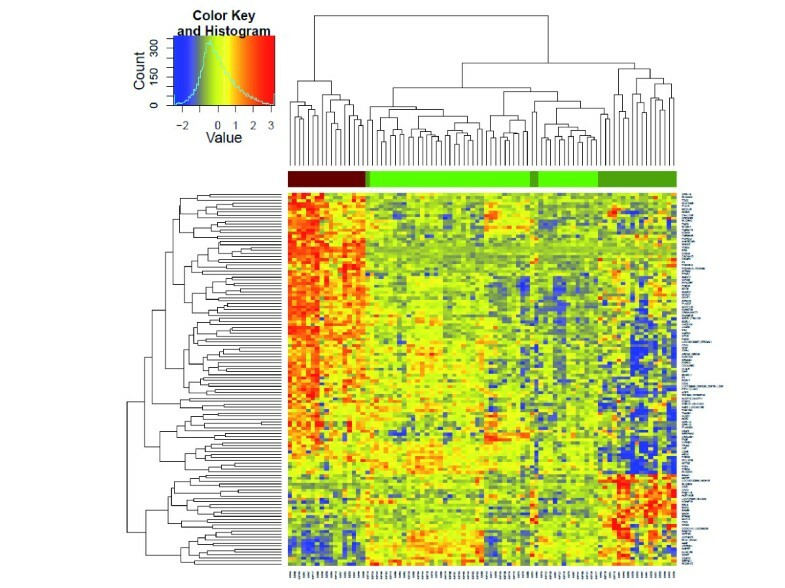 Clustering of the deregulated genes demonstrated that fusion-negative tumor specimens were more closely related to normal tissue, whereas fusion-positive samples showed distinct transcriptional modulation (Figure 1). TMPRSS2-ERG specific transcriptional modulations. Clustering of 48 benign (light green), 20 fusion-negative (dark green) and 17 fusion-positive (red) prostate cancer tissue samples. Clustering is based on the expression levels of 126 genes, which showed at least 2-fold expression changes (Additional file 4: Table S4) between the TMPRSS-ERG positive and negative subgroups. Expression values are color-coded (red = upregulation; blue = downregulation). Of the 126 genes from the TMPRSS2-ERG comparison, 24 genes were also found in our initial comparison of expression profiles between tumor and benign tissue samples (Figure 2). For example, TDRD1 was significantly upregulated in TMPRSS2-ERG positive tumors compared to normal (p = 1.77*10-9, FC = 26) and fusion-negative samples (p = 1.51*10-9, FC = 23) whereas no remarkable difference between fusion-negative and normal prostate tissues was found (p = 0.025, FC = 1.1; Figure 3A). CRISP3 has been frequently suggested to be a biomarker for prostate cancer detection and prognosis [23–26] and showed the highest fold-change in the initial tumor-normal comparison (Additional file 3: Table S3). Inclusion of the TMPRSS2-ERG subgroup information, however, revealed that CRISP3 gene expression is associated with the ERG status, since it is significantly upregulated in TMPRSS2-ERG positive tumors compared to normal tissue (p = 2.2*10-12, FC = 37, or p < 0.001, FC = 29, respectively; Figure 3B). 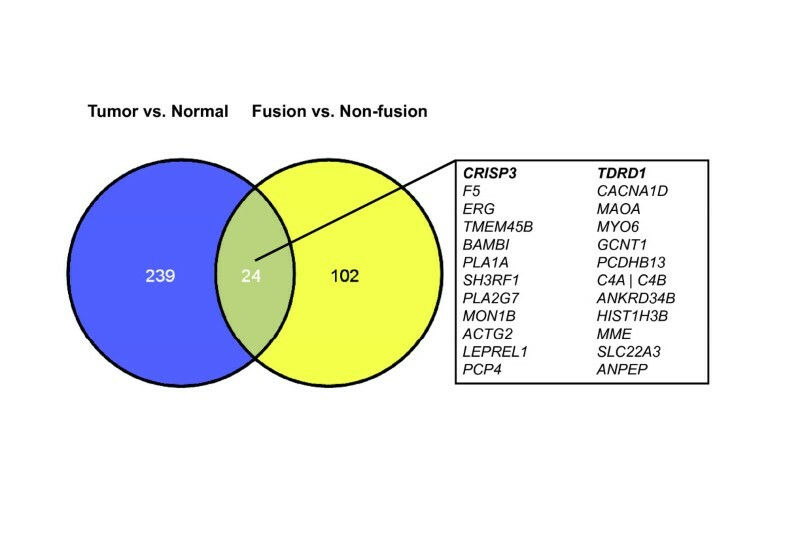 In contrast, less remarkable expression changes of CRISP3 were found between normal and fusion-negative tumor samples (p = 0.03, FC = 1.2; Figure 3B). To verify these results, we performed a technical validation in the same sample set by quantitative RT-PCR (Additional file 5: Figure S1) and we also included an independent validation study of recently published prostate cancer gene expression profiles . 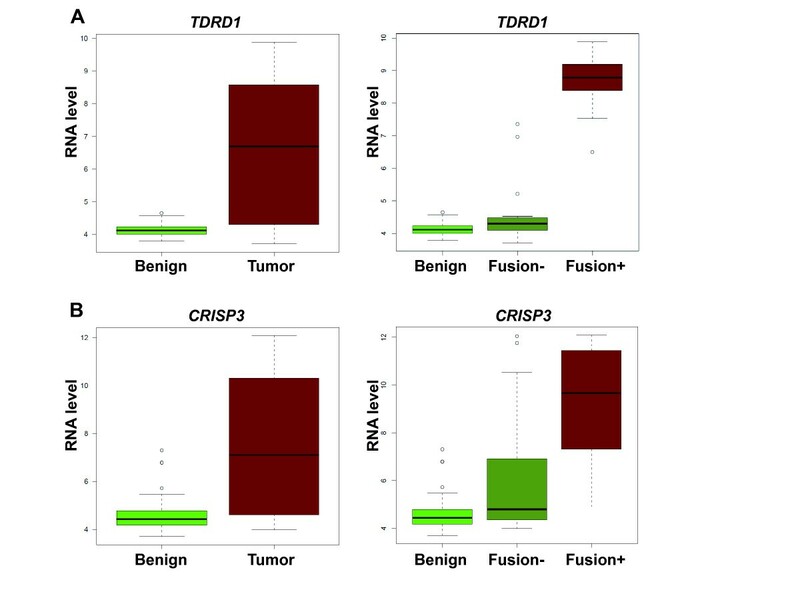 CRISP3 and TDRD1 were also found to be considerably upregulated in gene fusion-positive samples compared to benign and fusion-negative tumor samples with qPCR-based analysis (Additional file 5: Figure S1) as well as in the validation cohort (Additional file 6: Figure S2). Overlap of prostate cancer and TMPRSS2-ERG biomarkers. Significant genes with at least 2-fold expression changes in the tumor-normal comparison (blue, Additional file 3: Table S3) and the TMPRSS2-ERG subgroups (yellow, Additional file 4: Table S4). Association between biomarkers for prostate cancer detection and TMPRSS2-ERG gene fusion. Gene expression of TDRD1 (A) and CRISP3 (B) in 48 benign, 47 tumor (left side) as well as in the TMPRSS2-ERG (20 fusion-negative vs. 17 fusion-positive tumor samples; right side). The overlap between TMPRSS2-ERG deregulated genes and candidates for prostate cancer detection (Figure 2) might be due to the high expression fold-changes induced by ERG. CACNA1D, for instance, has been described as a downstream target of ERG, but was also found to be one of the top candidate for prostate cancer detection in the initial tumor--normal comparison. In line with previous reports, MYO6 was also found to be upregulated in TMPRSS2-ERG gene fusion positive tumors , although MYO6 has been reported as a marker for prostate cancer development . Therefore, the results suggest that well-known biomarkers like CRISP3 and MYO6 might not be related to prostate cancer development but rather to transcriptional alterations induced by the overexpression of the transcription factor ERG in fusion positive prostate tumors. Other markers with unknown function (e.g. TDRD1, F5) might be associated with the molecular mechanism of TMPRSS2-ERG gene fusion, but should be avoided as biomarkers for prostate cancer, since they are not appropriate for the detection of TMPRSS2-ERG negative tumors. To study the transcriptional changes induced by TMPRSS2-ERG gene fusion, we applied Ingenuity Pathway Analysis software to investigate overrepresented pathways among the genes with significant upregulation in fusion-positive tumors. The top canonical pathway was "Factors promoting cardiogenesis", a combination of TGF-β, BMP and WNT signaling (Additional file 7: Figure S3). Overrepresented genes from the top canonical pathway were validated in the publicly available data set of gene expression profiles from clinical prostate tumors . Almost all of these pathway-specific genes were also found to be significantly upregulated in fusion-positive patients in the validation cohort (Table 1). Activated WNT signaling was recently described to be among the most highly enriched pathways in ERG-overexpressing tumors . It is also associated with epithelial-to-mesenchymal transition in fusion-positive tumors . In addition to WNT-signaling, we identified a significant upregulation of the TGF-β/BMP signaling pathways in TMPRSS2-ERG fusion-positive patients. The interaction between the pathways seems to be relevant in gene fusion-positive prostate cancer, since TGF-β has been extensively discussed as the main initiator of EMT  and is known to closely interact with WNT-signaling . The exact molecular mechanisms leading to an enhancement of TGF-β signaling in fusion-positive tumors are so far unclear and should be analyzed in future studies. One explanation might be the cross-talk between androgen and TGF-β signalling . ERG has recently been described to suppress androgen signalling . Since androgen deprivation induces TGF-β signaling in prostate cells [32–34], it is tempting to speculate that ERG-induced suppression of androgen signal transduction leads to an increase of TGF-β pathway utilization which - in combination with WNT signalling - results in EMT and cell invasion in fusion-positive tumors. In conclusion, our data suggest that the TMPRSS2-ERG gene fusion marks a molecularly distinct tumor entity with substantial transcriptional modulation. In particular, our gene expression data indicate a deregulation of WNT and TGF-β/BMP signaling in fusion-positive prostate tumors. The inclusion of benign samples in our gene expression analysis additionally demonstrated that well-known biomarkers for prostate cancer like CRISP3 are associated with the TMPRSS2-ERG fusion status. Thus, these genes might not be primarily related to the tumor status but rather to ERG-induced transcription remodeling. Therefore, it would be beneficial to consider the fusion status in the discovery and assessment of molecular biomarkers for prostate cancer. Recently, Karnes et al. were the first to test the performance of prostate cancer biomarkers in TMPRSS2-ERG positive and negative subgroups . Their results underlined that the prior knowledge about the TMPRSS2-ERG fusion status will help to identify more accurate biomarkers and to develop novel targeted therapy strategies for prostate cancer in the future. We thank Thorsten Kühlwein, Elizabeth C. Xu, Sabrina Balaguer-Puig, Maike Wosch and Annika Bittmann for excellent technical assistance. We thank Mark Laible for helpful discussions. This work was supported by the German Federal Ministry of Education and Research in the framework of the Program for Medical Genome Research (01GS0890).